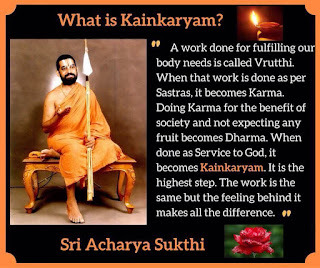 What exactly is acharya kainkaryam? The other day, adiyen was discussing a beautiful story from Ramanujacharya's life history with a few kids in a class. The story was about how Sri Vaduga Nambi lay himself on the hot scorching sand of the river Caveri shore. Vaduga nambi then put Ramanuja's tirumeni on himself so that Ramanuja can be safe as he prostrated in front his own acharya, Tirukoshtiyur nambi. The Lord's names are not like the names of the people whose behavior is completely out of sync with the name. For instance, someone might be named Rama, however, there behavior could be like Ravana. Unlike the mere mortal people, the Lord's 1000 names describe the qualities of the Lord. Hence, by just chanting and thinking of the name, we can inculcate atleast few of those divine qualities. Moreover, chanting the name in the group multiplies the effect. For example if there are 2 people chanting then the effect is 10 times 10 = 100 times. If there are 2 people chanting then the effect is 10 times 10 times 10 = 1000 times. So do join the group and experience the bliss ! 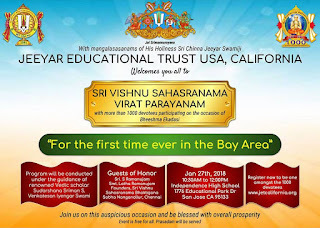 Jai Srimannarayana ! జై శ్రీ మన్నారాయణ ! This is a life-time opportunity to be part of something bigger than ourselves. 216ft of Sri Ramanuja Swamy is coming up shortly in the beautiful city of Hyderabad, India. Hyderabad and India will soon be identified with the monument and we can all proudly say that we were part of a generation that made the statue happen. You can always reach out to your local Jeeyar Education Trust chapter members (jetusa.org) to learn more about the project and be part of it.